If you're a developer publishing apps on Google Play, the developer console is probably something you're checking every day compulsively. 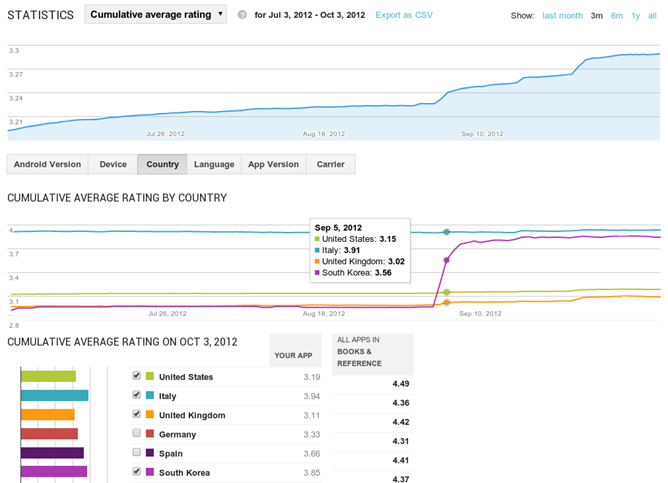 And Google understands that just because you're a developer, you don't need to look at something ugly and boring to track your apps' download and ratings stats, or manage their publication status. Back at I/O in June, Google showed off a bunch of new console features that were "coming soon." 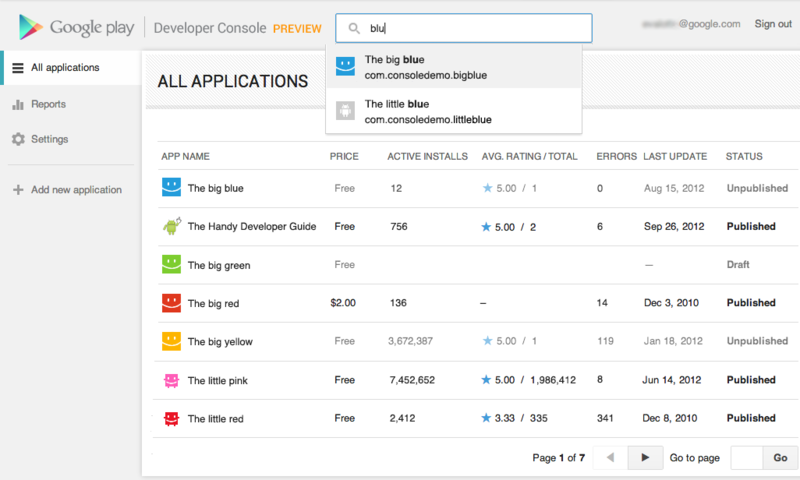 And today, Google is finally unveiling those features in a brand-new version of the developer console, and you can start using it right now. Just head over to the console, and hit the "Try the new version" button (as Google has previously done with Gmail and Analytics), and you'll be good to go. Alternatively, head to this link. Now, this new console isn't quite finished yet - certain features are missing, and you'll need to go back to the old console to use those. Specifically, multiple APK support, APK expansion files, and announcements are not yet available. But the new console also has new things, like a totally revamped UI that should load quickly no matter how many apps you have. Another big feature is the new user ratings statistics interface, shown below. 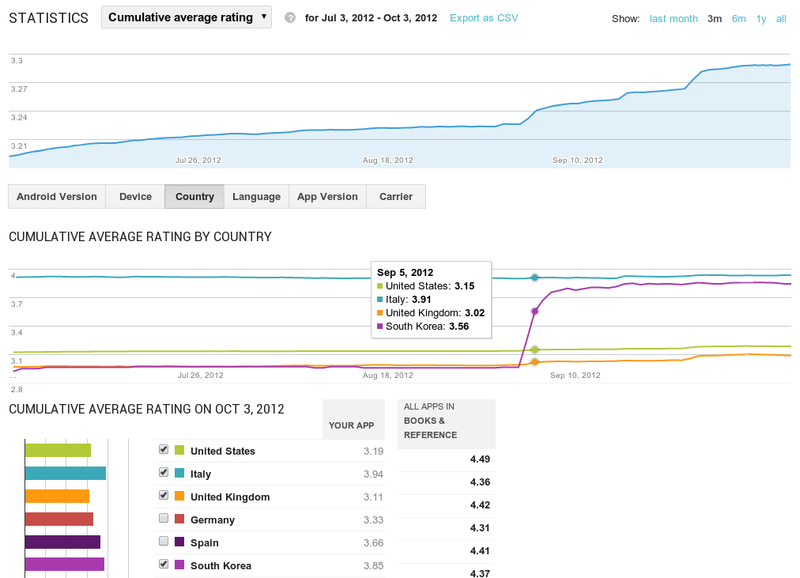 You can now track your average ratings over time, or the average new user rating every day. Like the existing stats features, you can sort this information by device, country, carrier, Android version, and app version. The app publishing process has also been streamlined, allowing you start with either an APK or simply an app name, and to save an unfinished app before you're ready to publish. And, the publishing interfaces now allows you to see the differences between the new and old versions of your apps, to make sure everything's as it should be before you send it out to the world. Finally, new options have been added for listing your app in up to 49 different languages on the Play Store, and Google will do all the translating for you (just remember, you're putting your ratings in Google Translate's sometimes-capable hands). As I said before, just head over to this link to give the new console a whirl. You can also head over to the Android Developers Blog for more information.